Editor’s Note: Geoff Reid appears on WVHooligan.com each week. Today he returns to talk about what’s going on with legendary Brazilian Ronaldinho. Feel free to leave Geoff your thoughts below. In 2005 and 2006 he dazzled crowds with excitement in Barcelona and beyond with his skills and beaming smile. He won World Soccer Magazine�s 2005 world player of the year and FIFA�s award followed by a Champions League title in 2006 with a few La Liga titles thrown in there as well. The question is what happened to Ronaldinho? I must admit I�m a big Ronny fan and still am. He symbolized what makes the game beautiful and enjoyable to watch. I still have a poster of him on my bedroom wall since my college days. We must also remember is that he is still at a big club playing his football compared to his fellow countryman Adriano who had bags of potential earlier this decade when Inter Milan snapped him up, then we all know what happened to him. Ronny is playing for the other Milan giants and while last season he didn�t fully impress in the red and black it was more then a transition to Italian football then anything else. After the 2006 World Cup where Brazil by their own standards failed at the quarter final stage to France in a rematch of the 1998 final. At club level a new phenomenon by the name of Lionel Messi started to take center stage and next thing we knew Ronny wasn�t first choice under Frank Rijkaard anymore. Once Rijkaard was out the door and replaced by former club captain Pep Guardiola the former world player of the year was sold to Milan. While there is no specific answer for this, there are several different theories. Firstly, he probably read all the press clippings about him with everyone praising him and rightly so, and getting caught up in all the hype which leads us to the next possible answer: after winning the World Cup in 2002, the Champions League in 2006 and a few La Liga titles in between what else was there for him to win? He won the two biggest trophies in world football with his national team and club side and domestically was part of a dominating force. This now leads us to the third possibility: stories about him spending too many nights out on the town in the Catalonian capital and a poor showing against arch rival Real Madrid in his final season at FC Barcelona had all the writing on the wall. Can he turn things around and prove himself again? Absolutely and I�m not saying that because I�m a fan, this season is perfectly poised for him to recapture his old form. First of all, Milan have a new manager in Leonardo which is a big risk for the Rossoneri being a rookie manager but someone who knows Ronny and the club well being a former player. Last season it was clear changes needed to be made in Milan and Carlo Ancelotti leaving was good for him. While Carlo is an outstanding manager, he was too loyal to the veterans at the club and no matter how good or how hard Ronny tried it could not compare to Paolo Maldini in his final season of his career. A new manager means players have to prove themselves and his situation is no different. Another thing going for the Brazilian is his age being only 29. A player of his talent never loses it overnight. On top of all that, add in this being the season before the world cup begins which no doubt he�ll be in the Brazilian squad of 23 for South Africa, but a starting spot will be up for grabs with the talent pool the size of Brazil�s. He should also be more motivated this coming season by playing Champions League football again after playing in the UEFA Cup last season and trying to wrestle the Scudetto back from city rivals Inter Milan should be enough motivation in itself, especially when their manager is the arrogant Jose Mourinho. Lost in all these reasons as to why he lost his form we also must take into account his bad luck with injuries in his final season with FC Barcelona. Injuries will slow a career way down and even end a promising one, just ask John O�Brien. For him just like any other player in the world is it all comes down to confidence. Sacha Kljestan is exactly the same in that sense. Injuries plays an important part in lacking confidence. Ronny had this summer off and it was his first summer off in a few years and will be fully rested going into pre-season which makes a world of difference. 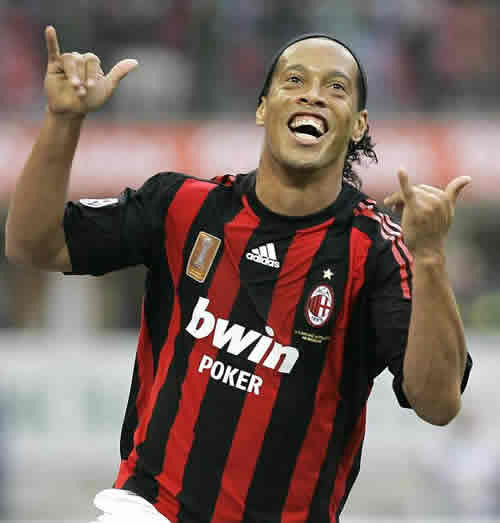 I fully recommend to everybody to purchase tickets for Milan friendlies this summer if they�re playing in your area not only to see Oguchi Onyewu in a Rossoneri shirt in the flesh, but also Ronaldinho because I�m predicting a big season from him this year and I fully believe we will be seeing a new fire lit under him to do well with club and country. I totally agree, he&acute;ll be back to highest level. I believe in him, but I feel he doesn't care anymore. I totally agree, he�ll be back to highest level. Well, seems like Nike might have dropped him. I saw the spring10 collection and his line has been replaced by Total 90. There’s no Ronaldinho shoe either. I believe in him, but I feel he doesn’t care anymore. He could have a good season with Kaka gone.